The OzFoxes FoxWeb: Fox & Wildlife Art, Fox Facts and Lore! This is the Web home of R&M Creative Endeavors. 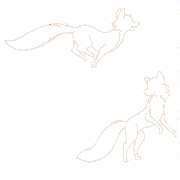 Here you will find lots of family-friendly material relating to one of our favorite animals, the fox. Here we are on another Wednesday. We hope yours is going well, and that the midweek brings you many opportunities to gear up for the rest of the week! Spring is quickly drifting into Summer here in Oz, with the occasional bout of snow to remind us that nothing is certain. That's okay too; what snow we had barely amounted to a dusting, and it was fun to watch. Still, one wonders what the plant and animal life think of it all when we hit the low 80s one day and have near-freezing temps the next. Mom Nature likes keeping things interesting, that's for sure. Morel hunting season is also in full swing, with all the tastiness that entails. Margaret is being very careful, noting which mushrooms are ready for picky and which will survive a few more days to get big. Fun times tromping through the woods, with rewards for being both careful and observant! We hope you are finding rewards of your own as you wander through Life. Pay attention and enjoy what you can, and we'll hope to see you here again on Friday. It's Wednesday, so there's a new Faux Pas online. For those who are catching up, the Faux Pas archives are online thanks to the very fine folks at Purrsia.com. If you're looking to see which pages are where and which were updated recently, be sure to check the Site Map for all the details. There's also a guide to navigating the FoxWeb, for those who would like some hints on what to find where. All material © 1996-2018 by R&M Creative Endeavors. All rights reserved, even those you think we're not paying attention to. Nothing here is public domain, so please: DO NOT COPY!